How Trump's Executive Order Will Affect Humanitarian Aid Workers : Goats and Soda The order will have a direct impact on the thousands of international aid employees who travel from country to country to provide life-saving aid. Passport holders from Iran, Iraq, Libya, Somalia, Sudan, Syria and Yemen are suspended from entering the U.S. for 90 days, according to the executive order issued by President Trump. International humanitarian aid organizations say the travel restrictions issued by President Donald Trump on Saturday could have a dramatic impact on how they operate. The Trump executive order temporarily bars all refugees and suspends — for the next 90 days — entry to the U.S. by citizens of Iran, Iraq, Libya, Somalia, Sudan, Syria and Yemen. The White House says the order was intended to protect the nation from "foreign terrorist entry." But the order raises many questions about the ability of aid workers to move around quickly and freely if they have ties to any of the banned countries. "To function, humanitarians need visas and access," says Sam Worthington, CEO of InterAction, a coalition of global aid groups. We spoke with several aid groups that work in the listed countries about the possible effects on their workers. 1. Aid groups are restricting employee travel. The executive order is clear about restrictions for anyone holding a passport from one of the seven restricted countries — and about exceptions. 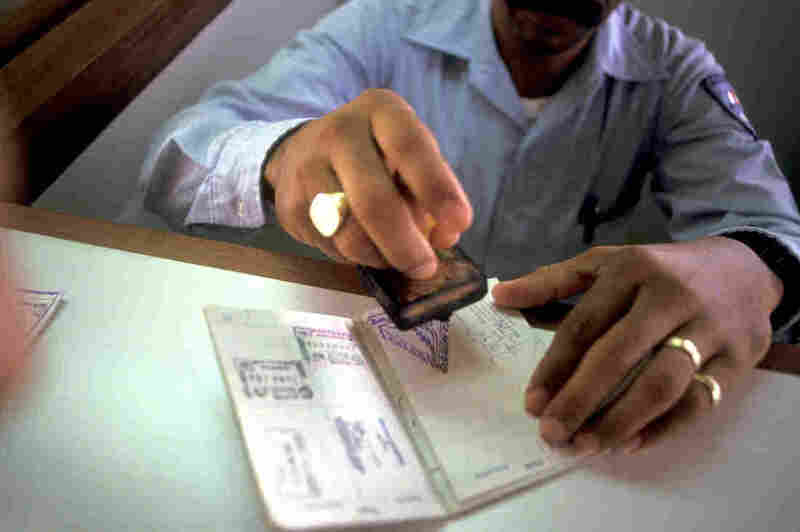 Some visa categories, like diplomats and U.N. workers, are excluded. But there's a lot of ambiguity in the executive order on how individuals — U.S. citizens or otherwise — can travel to and from the seven banned countries, says Nick Osborne, vice president of international programs for CARE, a global aid group. At the least, Americans traveling to and from those seven countries could face scrutiny when returning to the U.S. In an interview on NBC's Meet the Press on Sunday, White House Chief of Staff Reince Preibus said: "If you're an American citizen traveling back and forth to Libya, you're likely to be subjected to further questioning when you come into an airport." CARE has asked its U.S. government contacts to clarify the executive order, wrote Holly Frew, CARE's emergency communications manager, in an email to NPR. Because of the uncertainty surrounding the order, CARE has placed immediate travel restrictions on their staffers. For example, U.S.-based employees from the seven nations aren't being authorized to leave the country at this time. As an added precaution, U.S. citizens employed by CARE, either at home or abroad, are not to travel to any of the seven countries, wrote Frew. The lack of clarity could make it hard for groups to quickly deliver aid if a crisis were to arise. For CARE, the brewing food crisis in Somalia is top of mind. "We need to be able to deploy staff within 72 hours," says Osborne, citing the need for on-the-ground employees like water and sanitation experts or logisticians who can map out food transport. "If we can't do that, people are going to suffer." 2. For the next 90 days, aid workers who are citizens of the seven banned countries will not be able to travel to the U.S. In many countries, local staffers make up much of the crew that operates aid projects on the ground — especially in countries where ongoing conflicts put foreign nationals at risk. Many times, these employees have crucial, on-the-ground knowledge that shapes aid strategy. These staffers come to the U.S. for many reasons. Save the Children, for example, brings experts from various countries to meet with members of Congress and U.N. officials, share knowledge with American colleagues and tell their stories to journalists — including NPR reporters. Last March, to mark the fifth anniversary of the Syrian civil war, Save the Children brought in an expert from a partner organization in Syria that specializes in education, health and nutrition. "Jiddah," as she was called — she used this alias for safety reasons — shared the conditions children and families were facing in the besieged areas. This March, the group was planning to bring to the U.S. two Syrian experts on mental health to speak at the launch of a report on the effects of civil war on children. The travel ban would make this virtually impossible. Since the executive order was signed, Oxfam has had to cancel upcoming visits from citizens of the listed nations, says press officer Bhatti. Skype and phone calls are no substitute for real face-to-face engagement, says Michael Klosson, vice president of policy and humanitarian response at Save the Children. These encounters, he says, are "much more meaningful than strangers meeting over a conference call." 3. Trump's ban could cause other countries to place travel bans on U.S. workers. There's a chance the seven countries may restrict Americans from entering their countries. If that were to happen, aid workers would likely be affected. Unlike diplomats or U.N. employees, aid workers don't have special visas that ensure safe passage when traveling. "In today's environment, where the U.S. is issuing executive orders that put up barriers, we could expect that Sudan or Iraq or others will begin to make it more difficult for individuals who are providing aid to come to their countries, too," says Worthington of InterAction. In response to the executive order, Iran and Iraq have both called for reciprocal measures. In a statement earlier this week, the foreign affairs ministry of Iran called the restrictions "insulting" and said they would take "proportionate legal, consular and political action and ... will take reciprocal measures in order to safeguard the rights of its citizens." The Iraqi government is considering suspending visas for American citizens. Currently, the group has one American employee working in logistics in Mosul, where he manages aid sites and procures aid goods to distribute. "What would we do if that staff member [leaves the country and] can't get back to Iraq?" says Klosson of Save the Children. "Where can we find that expertise that the staff member has?"